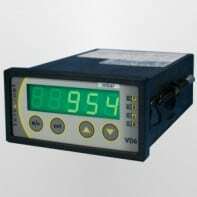 The Thyracont VD6 universal vacuum indicator and controller is designed for panel mounting. A relay monitor on the front panel allows continuous operation control of the two switch points. Available as complete set with Thyracont transducer type VSC43MA4 (1400 – 1 mbar) or with transducer type VSP63MA4 (1000 – 1 x 10-4 mbar).